Discover the Amazon during your price guaranteed Ecuador vacation. All of our Ecuador tours have daily departures and are fully customizable. The Amazon Rainforest in Ecuador, known locally as “La Amazonia” or “El Oriente” (The East), covers 29 million acres (12 million hectares) in the eastern half of the country, although less than 5% of the country’s population lives here. Like other zones of the Amazon, the Ecuador Amazon is comprised of incredibly lush vegetation and unbelievable biodiversity. It is also home to over 100 more or less remote communities, such as the Siona, Ashuar, Kichwa, Zaparo, Quijos, and others, that have remained isolated and preserved their indigenous ways of life over the course of centuries. The rivers, lakes, streams, and marshlands in this part of the Amazon host diverse microclimates and ecosystems. Alluvial plains are fed by rich soils that flow from the eastern slopes of the Andes. Palm trees grow ubiquitously here and the terraces are used for farming. Some tree species soar to over 150 feet (42 meters). Caimans, monkeys, sloths, bats, tapirs, jaguars, boars, anacondas, river dolphins, and manatees are just some of the unique Amazon animals you might see on an Amazon tour. Astoundingly, 1,000 species of vertebrates have been identified in the Ecuador Amazon. In short, an Amazon travel adventure is ideal for travelers seeking to sample the sheer biodiversity of this part of the world. Amazon travel is relatively easy in Ecuador, with the principal point of entry located on the Napo River, a tributary of the Amazon River. 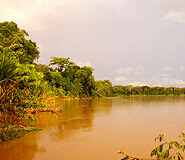 Communities of natives and settlers have settled on the banks of the Napo River and this is also the location of various Amazon lodges and hotels. 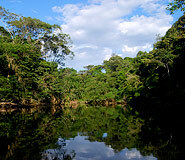 Beautiful national parks and reserves have been established to conserve the richness of the rainforest. These include Yasuni National Park, Limoncocha Ecological Reserve, and Cuyabeno Wildlife Reserve, which are all located within a day’s journey from Quito, the capital city of Ecuador. At first sight, the Amazon Rainforest is a vast humid and green space. But closer examination will yield a wealth of surprising activity. Over 100 species of trees, including cinnamon, silk cotton, and jacarandas, have been identified on just one acre in the Upper Amazo Basin. By comparison, in the temperate forests of Europe and North America, 20 species of trees per acre is common. And for every individual tree, hundreds of other plant and animal species are constantly interacting to create this astonishing ecosystem. 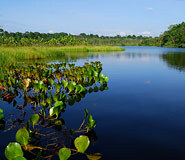 The Ecuador Amazon offers some of the best opportunities for ecotourism. Activities to do on your Amazon travel experience range from adventure tours such as canoeing, rafting, or kayaking, to bird watching or wildlife observation, to participation in community-based ecotourism programs, or even stays in luxury lodges with hot water and swimming pools. There is literally something for everyone. Most Amazon travel tours depart from the ports of Tena, Francisco de Orellana, and Nueva Loja. Nueva Loja, the northernmost hub in the Sucumbios Province, is the gatway to Cuyabeno Reserve and Limoncacha Biological Reserve. Although relatively less developed, here you’ll find a vast diversity of wildlife and budget-friendly options in lodging. Francisco de Orellana, or Coca, is located at the confluence of the Coca and the Napo rivers and serves as the point of departure for excursions to Yasuni National Park and Huaroni Reserve, as well as parts of Cuyabeno and Limoncacha. Tena has the most developed infrastructure for Amazon travel. Here you can stay in town and take day trips into the jungle, or head down river to an isolated lodge. The Amazon Rainforest has a consistently tropical, warm, and humid climate, which makes Amazon travel enjoyable to at any time of year. Average annual temperatures range between 73 to79°F (23 to 26°C). Rain is common throughout the year averaging between 300 and 400 cm of precipitation. The driest months are November, December, and January, which are immediately followed by the rainiest in February, March, April, and May. Polar winds from the south cause occasional cold spells, known as surazo (from the south) or friaje, and can drop temperatures to 62°F (17°C). The award winning Kapawi Ecolodge & Reserve is located in one of the most remote and well protected parts of the Ecuadorian Amazon and is only accessible by air. Known for its ecological sensitivity as well as its high quality of service, this rustic yet elegant Amazon lodge offers unparalleled access to wildlife and biodiversity. Located in the territorial lands of an indigenous nation, Kapawi provides a range and depth of cultural experiences unmatched by any other rainforest lodge. Kapawi Ecolodge & Reserve is constructed entirely using traditional Achuar architecture and fans out around an ephemeral lagoon home to an astonishing array of plant and bird life. A wooden boardwalk meanders its way from the river through the jungle to the lodge itself, and continues out over the lagoon, providing an ideal location for early morning bird watching while sipping freshly brewed coffee. Each of the 18 cabins features a private bathroom, access to a balcony and hammock, electricity, and solar heated hot water. Beautifully located on the bank of a canal in the upper Amazon basin, the Cotococha Amazon Lodge provides a perfect base to explore the varied wildlife and nature of this spectacular region. With its 21 independent bungalows built according to traditional architecture in harmony with the surrounding rainforest, the lodge is truly a piece of paradise where travelers can reconcile their love of nature and desire for comfort. Enjoy the sights and sounds of the Amazon from a reclining chair or hammock on your bungalow’s private veranda. The entire lodge is thoughtfully decorated to complement the beauty of its surroundings. Although the cabins do not enjoy electricity, they are equipped with oil lamps, which make for a romantic and intimate atmosphere at night. Relax in the comfortable lounge with its beautiful fireplace, or enjoy delicious traditional Ecuadorian meals prepared by the restaurant’s talented chef.